DSC_4348, originally uploaded by hep. our bike ride today was awesome! these are all our bikes, including 2 more unpictured. 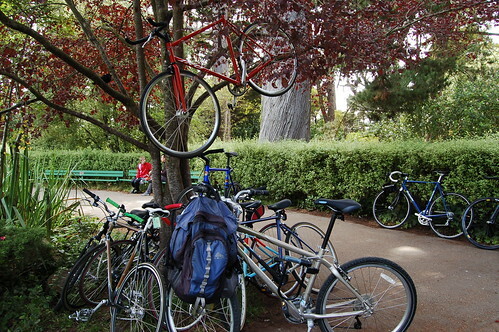 this is a bike tree! it grows bikes! I want to plant a bike tree! However my proximity to Portland would ensure that I had obnoxious hipsters sneaking into my yard and picking them all the time. Especially if it grew fixies. I'd have to get a shotgun.